Joliet, IL— After a lovely morning and early afternoon letterboxing our way down I-39/I-90 from southern Wisconsin into northern Illinois, we entered the Chicago area and the land of the Illinois Tollway. 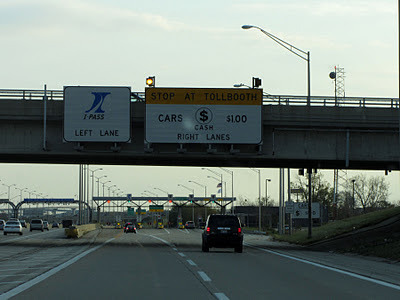 There I was driving down an interstate highway, a federally funded highway, minding my own business, when suddenly I see a sign indicating that a tollbooth is ahead. What the heck? 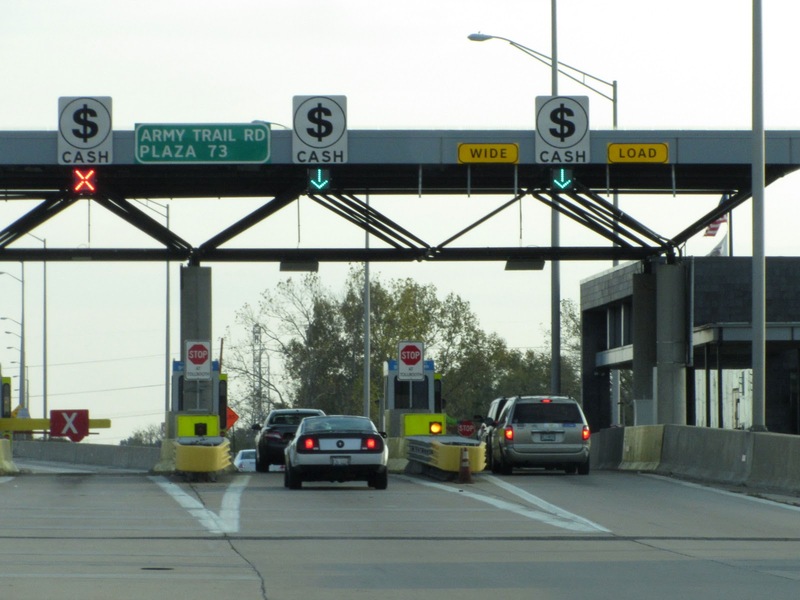 A tollbooth on an interstate highway? Didn't we already pay for this road? 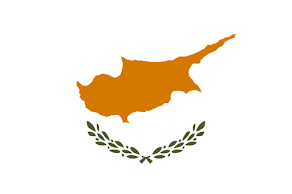 What about all those gasoline taxes we ponied up? Does Barack Obama know about this? We need to call our senators. Meanwhile, our faithful Garmin was berating me to "Keep left onto I-90," and I certainly didn't want to traumatize her into recalculating. Yes, I saw the signs for the toll plaza in the two right lanes. But since the GPS knew we were going to Joliet and the Tollway signs did not, I stayed to the left, thinking the toll plazas were part of an exit. Of course, as soon as we passed through, I realized I had been mistaken. 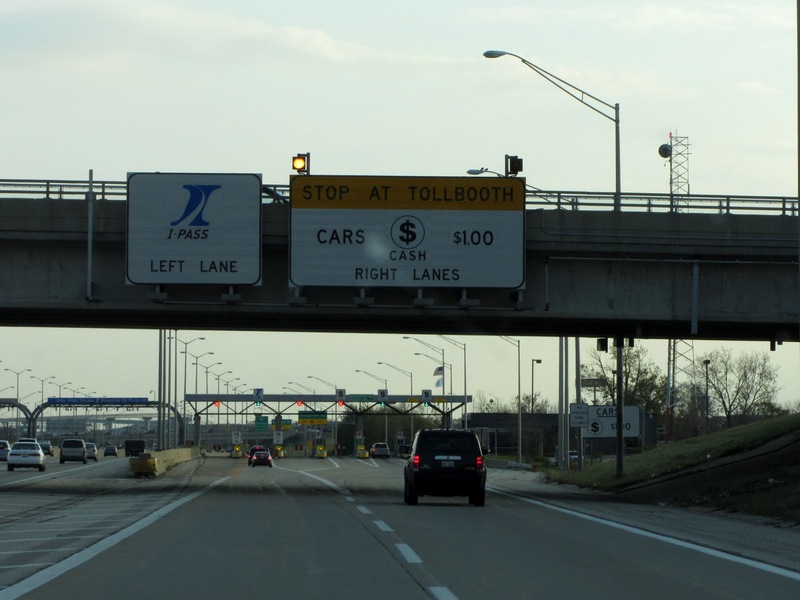 The tollbooth was for the highway, not part of an exit. What now? Not a good idea to back up on an interstate highway, even to pay a stinking toll. 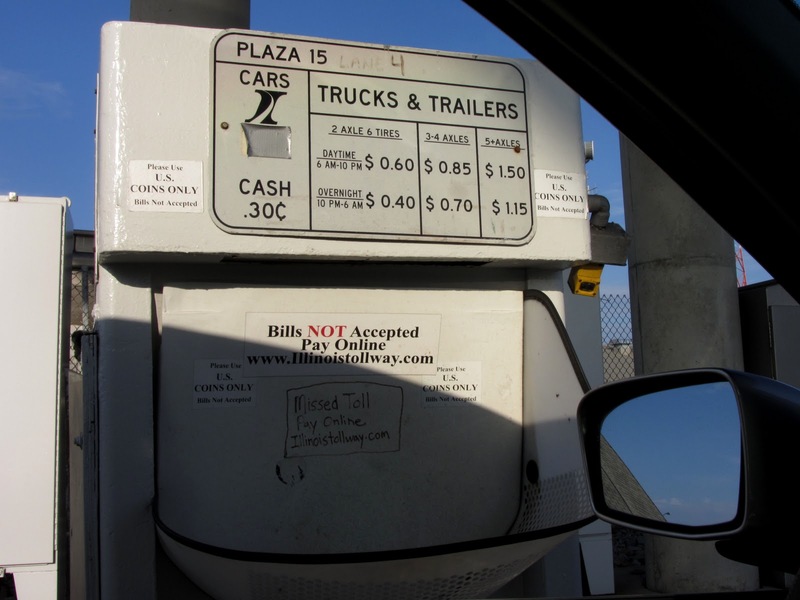 Get off at the next exit and drive north of the tollbooth and return to pay the toll, maybe. Then wouldn't we need to pay it twice? Almost immediately we saw a sign that said we could pay unpaid tolls online. Oh, goody! Geez, this could be so much simpler if Chicago would just do what most of the rest of the country does and stay out of our pockets on the highways we've already paid for once. As we learned later, of the 47,000 miles of interstate highways in the U.S., only 2,900 miles (about 6%) are toll roads. 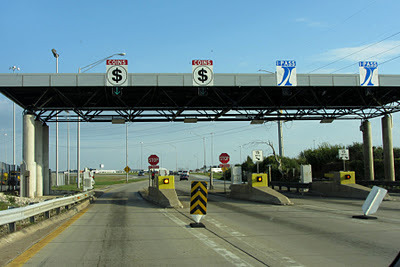 And the good old Illinois Tollways (operating only in the Chicago area) is collecting for of 286 of those miles. Yes, that's almost 10 per cent! 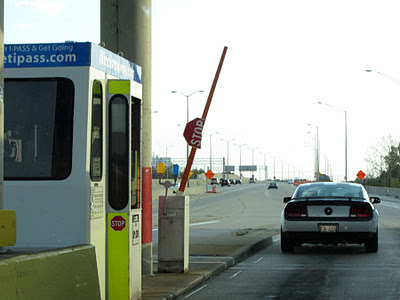 To add insult to injury, there is one tollbooth after another. You don't just pay once to use this highway. No, sir. Every few miles, you get to pay again... and again... and again. So at the next toll plaza, we explained what happened, that the GPS was telling us to stay to the left, and asked the not so friendly toll operator if we could pay her the toll that we missed. Indeed not, we were told. And the operator put us on notice that we were allowed to make only two mistakes on the tollway. I was afraid to ask what might happen if we committed a third breach of tollway rules. Then she generously scribbled out a pay by mail form for us and handed it over with a bit of advice for no extra charge. "Don't listen to your GPS," she warned. Is it really legal for Illinois to charge tolls for federally funded highways? As it turns out, these roads were grandfathered into the federal interstate system in 1956. 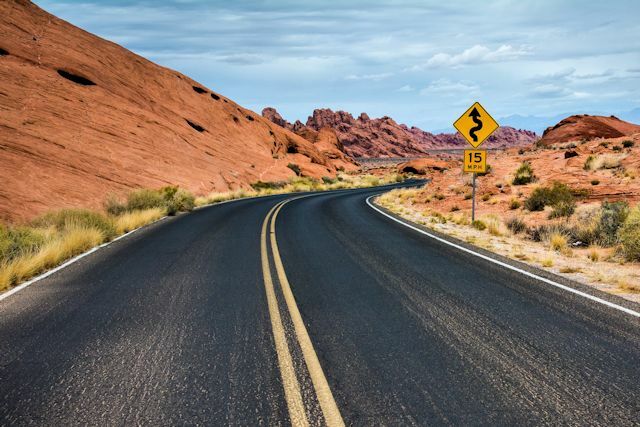 The roads were already in existence as toll roads, and the U.S. Bureau of Public Roads could incorporate the toll roads into the interstate system more economically than building toll-free roads through the same corridor. 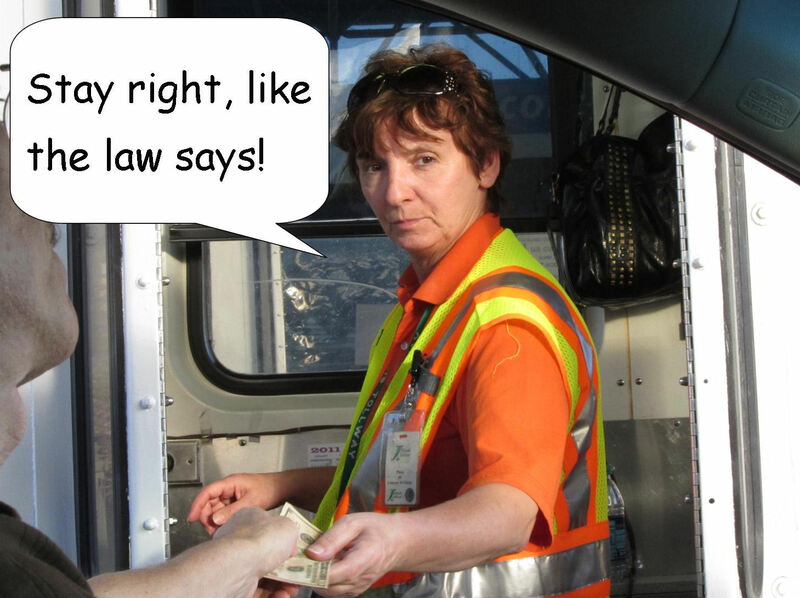 Make no mistake, the Illinois Tollway is serious about collecting tolls and will not tolerate scofflaws who listen to their Garmins. 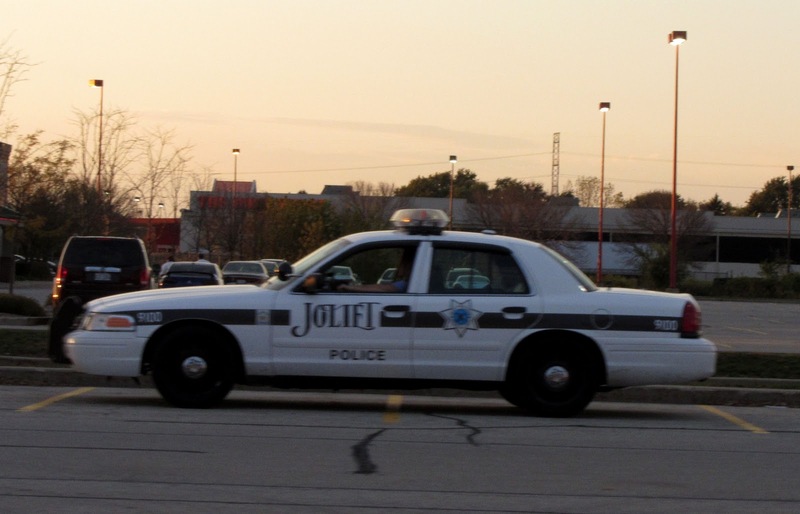 In fact, later in the evening when we returned to our car in the local Target parking lot, we found someone waiting nearby and wondered if he had come to exact payment of our unpaid toll. * Or pay it online and provide the Illinois Tollway with all our personal identification and credit card information to enter into their system, as if they haven't been in our pockets enough already.